please follow the link and read well! You would like to show your performance piece at the International Performancefestival "blauverschiebung"? We are pleased to announce a special workshop this October in Leipzig, Germany entitled 'Sculpting Action', organised by Galerie Kub as part of the Internationale Performancefestival „blauverschiebung“ in Leipzig from the 7 - 11 October 2015. Join us (Alexandra Zierle & Paul Carter) for a unique and highly experiential two and half day experimental workshop. We will be exploring the poetic language of performance through a range of methodologies and approaches. We will look at the more visible components of performance such as the body and our five senses, time, space, materials and odbjects, as well as investigate the more hidden components including intention, emotions, inner senses, embodiment, intuition, focus and visioning. This workshop is part of the Internationale Performancefestival „blauverschiebung“ in Leipzig from the 7 - 11 October 2015 organised by Galerie Kub, so participants will have the opportunity to see the evening performances as well as participate in other events. In addition to this we will also present a performance during the performance which participants will able to experience within the context of the workshop. There are also opportunities for participants to be part of a 'Performance Opera', a project that works with performance artists, an opera singer and ensemble to create a experimental 'performance opera', which could be developed and presented in December 2015 in Leipzig, with future possibilities of presenting the work in other cities. We are pleased to announce that this workshop is offered at a minimal cost of 30 Euros, with the rest of the costs for hosting the workshop being covered by Galerie Kub. However, participants are still required to finance their own travel and accommodation. Places are limited. Please get in touch if you have any questions or would like to discuss anything. Interdisciplinary, multi-sensory and always site and context responsive, Alexandra Zierle (DE) & Paul Carter’s (UK) practice spans performance and live art, socially engaged practice, video, sound, installation, and photography and their work has been widely exhibited internationally throughout Europe, Canada, United States, South America, Australia, in Asia and Africa. Through their collaborative practice, Zierle & Carter critically examine different modes of communication and what it means to be human, addressing notions of belonging, dynamics within relationships, and the transformation of limitations. Their work sites an embodied investigation into human interactions and encounters, acting as an invitation to venture into the spaces in-between the external and internal, permanent and transient, spoken and unheard. The work fundamentally explores society’s conventions, traditions, and rituals, often flipping them on their head, reversing orders, and disrupting the norm. The artists’ intimate relationship and subsequent dialogues with matter, in other words with the stuff we encounter on a daily basis, is key to all of their enquiries. Twice recipients of Arts Council England grants, including support for a residency at the Banff Centre in Canada, Zierle & Carter’s performance for camera piece Encounter – The Arrival won the audience award at the Exeter Contemporary Open 2011 and their work is featured in ‘Personal Structures Time – Space – Existence’ from The Global Art Affairs Foundation, and in Manuel Vason’s new Double Exposures publication co-published by Intellect and LADA. 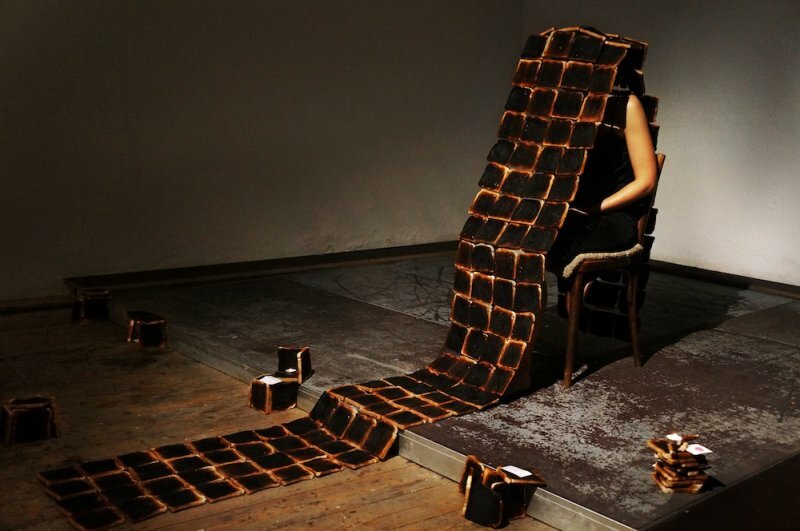 Guest lecturers at a number of international performance art workshops, including IPA 2014 in Romania and PAStudies in Kaunas, Lithuania, in 2015 they have and will present work and lead workshops in numerous platforms, festivals, exhibitions and events in Athens, Berlin, Thessaloniki, London, Essen, Linz, Kaunas and Leipzig.